Can You Pass the New Shelby, Alabama Voter Test? The Supremes want you to know: This ain’t your momma’s America! Not only did the highest drug-free Court in America make history this week by kicking the defenseless Defense of Marriage Act to the curb — but in refusing to rule on Prop. 8, they effectively made gay marriage legal in the state of California! The times they are a-changing, changing faster than conservatives can come up with new ways to express regrets to all those wedding invites from Bob and Ted and Carol and Alice. But all the celebration over rights for the LGBT community already distanced us from another way this Court says America has changed. Ominously — and in spite of its approval rating in Congress and a 25-year extension in 2006 signed by none other than SCOTUS mascot G.W. Bush — the Roberts Court decided this week that it was in the best interest of the country to gut the Voting Rights Act of 1965. More specifically, they scrapped the VRA’s Section 4. Section 4 basically decides which state and local governments fall under Section 5, which says that certain local governments — ones with a terrible, horrible, abusive history of disenfranchising minorities — must get “preclearance” from the feds before instituting psychotic voting laws. Laws like, say, voter ID requirements. Or laws that make it harder to vote when English isn’t a first language. Or laws that put undue burdens on voters in big cities or minority neighborhoods. To repeat: all this happened, he says, “largely because of the Voting Rights Act.” In other words, the dern thing works! So… let’s get rid of it! “Just as buildings in California have a greater need to be earthquake­proofed,” wrote Justice Ginsberg in her feisty dissent, “places where there is greater racial polarization in voting have a greater need for prophylactic measures to prevent purposeful race discrimination.” And she cited eight examples of recent attempted race-based voter discrimination, including in 2001 when six white guys in Kilmichael, Mississippi abruptly cancelled an entire election after “an unprecedented number” of black candidates tried to run for office. So, yeah, she’s saying: We kinda sorta still need to protect the voting rights of minorities. But voter rights were so last week. This is now! True, the Court left Section 2 of the act alone — it’s still (in theory) illegal to make it difficult for minorities to vote. But they just made it a helluva lot easier to try — and harder for the gubmint to stop ’em. 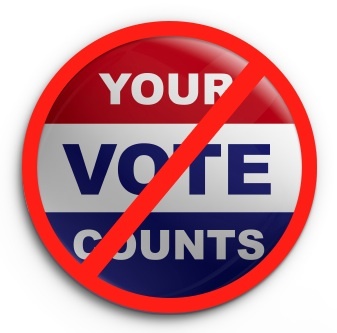 So what acts of voter suppression are these liberated local governments coming up with? Glad you asked. Check out what our Lester and Charlie operatives in Shelby County, Alabama just unearthed: A proposed quiz that all voters must take before being allowed to vote! Under the old Voting Rights Act, this quiz would be subject to federal review. Since the Roberts decision, however, it’s up to the voter to prove that this quiz is unfair. What do YOU think? Take the quiz to find out if you would pass! From Lester & Charlie’s “GOP Time Machine” Series: Racial Profiling!